Prior to the game, the hosting team apparently showed a video replay of the overtime goal scored by—Pittsburgh Penguin superstar, Sidney Crosby—and, though I’m certain they anticipated a loud cheer for the hometown hero, instead the crowd booed! Ha! They BOOED! Meanwhile, they also introduced the MVP of the Olympic tournament—Buffalo Sabres superstar goalie, Ryan Miller, who was not playing that night—to a standing ovation! What??! How great is that! The visiting goalie got a standing ovation, while the hometown superstar—arguably the most recognizable NHL player in the world?—was booed in his own building??? Four more years, and the gold medal could very likely go to the United States. 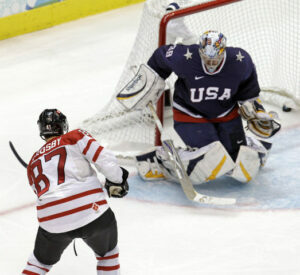 ← Olympic Hockey: National Personalities?